Pretty much everyone knows the story of Dr. Jekyll and Mr. Hyde, and if you don’t know, it’d be better if I don’t give any details at all, so I’m not going to talk about the plot at all. I first read this book in fall of ’06, and loved it. I read it again a couple months later, and now, a third time. And it just keeps getting better. The mood, atmosphere, and narrative voice are superb. Tone is everything here! It has both plot and meaning, both commercial appeal and literary value. It can be interpreted to mean many different things. 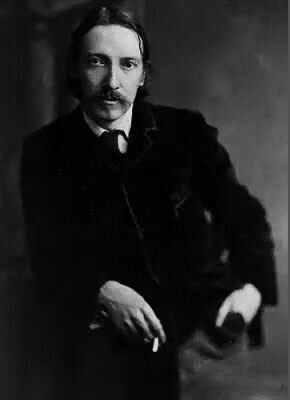 Robert Louis Stevenson was kind of a hottie. He had a really nice smoking jacket, too. It’s a perfect introductory classic for high school students – interesting and deep. I wish I’d read it when I was 16. 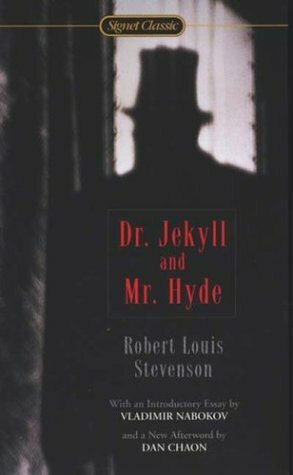 Stevenson doesn’t need to get into the gory details of Hyde’s crimes in order for the book to be disturbing and a little scary. It only takes a couple hours to read, and usually helps me with my writing. Stiffs, Inc. (my very favorite band ever) made a short film using one of the main characters, Mr. Utterson. It contains the line, “If he be Mr. Hyde, I shall be Mr. Seek.” I don’t care if it’s cheesy. That’s one of the Best. Lines. Ever. This little book, originally meant as a potboiler, addressed the human condition so fully that it’s now considered a classic. Seriously, I could keep going. I love this book to pieces. Today, as I read, I actually spent a long time thinking about what I learned in church growing up (how odd!). I’m not religious anymore, but back then they told us that Satan was always out there to tempt people, and that when someone gave in just a little bit, they became more used to sin, more desensitized, and would commit greater and greater sins until his soul was swallowed up completely. I put that side by side with Jekyll’s narrative in the last chapter of this book, where he talks about his evil nature growing stronger and more in control as he gave it free reign. I’m sure such a comparison was intended. The other thing that struck me particularly (today) was the book’s statement on choices, and how we all one day have to choose between responsibility and freedom. We cannot exist in a double life. I remembered the choice-tree Sylvia Plath describes in The Bell Jar, also one of my favorite books. Okay, so this book review is utter crap. I know it. I’m a little tired, and I’ve loved this book so long it’s hard to write coherently about it. Note: Review date is only an approximate of when this book was read/reviewed in 2009. Note: Originally read in October 2006. This entry was posted in 2009, Adult, Prose and tagged atmospheric, circus horror, classics, favorite, memorable, multi-read, psychology, reread, RIP-worthy, speculative. Bookmark the permalink.